France's National Front has used all the old fascist tricks to gain power. The 2015 French local and regional elections marked not only the government’s defeat and the Left’s collapse, but also the National Front’s (FN) breakthrough. The far-right party didn’t win any regions, but when compared to 2010, it tripled its vote count in the first-round elections and even won new voters between the first and second rounds. Between these results and polling, many expect the FN to perform much better than in 2002, when Jean-Marie Le Pen made it to the second round of the presidential election. The FN has consolidated the most reactionary elements of French society and is attracting a growing segment of the population. Should it attain power, it will likely not only legitimize the systematic racism that pervades French society but also, in order to satisfy its activist base, intensify already existing policies that target Muslim, Roma, and immigrant communities. Indeed, this is already happening in Calais before the demolition of the camp where thousands of immigrants were living and facing regular assaults from far-right groups. The FN’s electoral success has stoked some parts of the population, and solidarity with immigrants is barely organized. Additionally, small, violent groups have begun to grow, most notably the Identity Bloc (BI), which is close enough to the FN that they share members, including anti-Muslim activist Philippe Vardon, who’s now an elected member of the FN but has been sentenced to six months of prison for an assault against nonwhite people in 2014. In the face of the Right’s increasing power, the Left seems stuck between downplaying the FN’s danger and giving way to defeatism. Both attitudes stem from the Left’s inability to properly understand neofascist movements like the FN. On the one hand, some justifiably connect the far right’s rise to political and economic instability. Accordingly, Jacques Rancière depicts the FN as a “pure product of the Fifth Republic.” Others position it as a necessary side effect of neoliberalism. While this correctly places the fascist dynamic in the context of capitalism, it fails to capture its relative autonomy from capital’s immediate interests. Other theorists emphasize this autonomy as well as the mortal danger the far right embodies, but downplay its economic roots. This often produces the “lesser-evil” option, in which supporters claim that an electoral alliance with bourgeois political forces — such as the center-left Socialist Party (PS) or the right-wing Republicans (LR, formerly the Union for a Popular Movement) — is the only way to defeat fascism. Rather than fall into these traps, we should learn from historical studies of fascism and use their insights to shape our responses to the FN. When we do, we’ll see that we must reject not only the most violent expressions of xenophobia, but also the mainstream manifestations of racism that have overtaken French cultural and political life. Only by separating ourselves from both the far right and the extreme center can the Left defeat this rising threat. The first obstacle to understanding the French fascist dynamic comes from how the FN has been characterized from the 1990s, but especially in the last six years. Many mainstream analysts assure that the FN has transitioned from neofascism to “populism” (or “national-populism”), moving from the far right to slightly right of center. Some even assert that it has never been truly fascist because the French political culture would be “immune” to fascism, as many French historians have been constantly (and absurdly) contending that there has never been such a thing as an authentic French fascism in the twentieth century. However, the “National Front for French Unity” (which is its original name) was created in the early 1970s by the party Ordre nouveau, which was rooted in the history of French fascism, and the FN was imagined as a broad organization in which neofascists — renamed “nationalists” — could attract, maneuver, and lead all of the moderate nationalists of the traditional right. The illusion of a so-called transformation of the FN and of a “new FN” has met the party’s own narrative, popularized in recent years and according to which, since Marine Le Pen became the party’s main leader in 2011, the FN is no longer the far-right organization it used to be. This strategy, known as “de-demonization,” could not have been completed without help from journalists, policymakers (specifically Nicolas Sarkozy), and even some academics, all of whom legitimized her claims. Marine Le Pen’s takeover of the party and her open conflict with her father has then been taken as proof of the party’s fundamental transformation. But when one stops thinking of the political trajectory of the FN in terms of changing symbols and words, in order to think it in terms of a strategic project, Marine Le Pen’s break from her father represented no fundamental change in the party’s platform, but rather a new manifestation of the party’s longstanding strategy for gaining political support. The FN’s bait and switch aligns it closely with classical fascist political strategy. In The Anatomy of Fascism, historian Robert Paxton argues that far-right movements treat ideas as essentially instrumental: their promises contradict each other, and their platforms abruptly and radically change to gain a wider following. For example, fascist parties sometimes reject modernity, industry, and capitalism in the name of more deeply rooted, traditional values. Just as often, however, they defend these ideals in the name of national transformation. An instance of this ideological instrumentalism can be found in the FN’s so-called “social turn” — its sudden concern with the working class’s living conditions and its defense of public services. On closer examination, however, we once again find that this strategy dates back to well before Marine Le Pen took leadership. Jean-Marie Le Pen used to call himself the “French Reagan,” but in the early 1990s he broke with the neoliberal line. At that time he felt that, as left political alternatives for workers disappeared (especially with the French Communist Party’s decline and the Socialist Party’s conversion to neoliberalism), the FN could fill the gap. In doing so, the FN blurred the line between right and left and rediscovered one of classical fascism’s most effective tactics, while the FN used to present itself in the 1980s as a right-wing party more proud of its “values.” The “social turn” has been deepened by Marine Le Pen in the last years and, far from moving away from classical fascism, she actually got the FN closer to it. In Italy in particular, Mussolini’s party initially put forward a seemingly left platform that even made radical claims against private property. Once in power and allied with the traditional elites, it immediately jettisoned these election promises. The FN’s rebranding strategy is designed to mask its elite membership and leadership, thoroughly dominated by entrepreneurs, CEOs, and professionals (lawyers in particular). By putting it in the context of the party’s forty-year history, we can see how its false transformation relies on traditional fascist strategies. And yet many on the Left (and even the radical left) have bought, more or less explicitly, into the FN’s narrative. They no longer believe the party poses the same threat it did even fifteen years ago. As a result, the Left and the labor movement have been increasingly unmotivated to mobilize against the party. Some analysts point to the FN’s break with its antisemitic tradition to demonstrate the party’s changing politics. We should not overstate this evolution: as Nonna Mayer documents, FN supporters still report much stronger antisemitic feelings than any other voting sector. A party whose base remains mainly committed to antisemitism could use this poisonous rhetoric in the future if it seems necessary or even politically expedient. Nevertheless, we cannot deny that the FN leadership no longer participates in Holocaust denial and now minimizes its antisemitic history. While distributing pamphlets in the street, I realized that the glass ceiling was neither immigration nor Islam . . . It is antisemitism that prevents people from voting for us . . . Marine Le Pen has agreed on this for as long as I have known her. For the sake of respectability, the FN leadership has then abandoned public displays of antisemitism, now regarding it as a barrier — rather than a magnet — for attracting new electoral segments. Of course, this doesn’t mean that the FN has given up on racism. Instead, they have replaced Jews with Muslims as their main target. In France, voters are much less likely to condemn Islamophobia because of its omnipresence in the current political culture and because it perpetuates, under new and more tolerable forms, colonial racism. Racism still constitutes the ideological cement of the FN’s electorate and activist base. Nonna Mayer’s study notes that 82 percent of FN supporters claim to be either “rather racist” or “a little racist.” This racism is expressed as a violent hostility toward Muslims or indeed anyone perceived as such: as Mayer reports, one “characteristic trait of the FN’s partisans is an increased anti-Islamic polarization, which is far more blatant than their antisemitism.” Of course, Islamophobia is not confined to the far right, but the latter nevertheless expresses it most violently. Furthermore, despite the development of Islamophobia across French politics in the past decade, Mayer adds, the FN’s electorate continues to distinguish itself. When compared to other voters, 48 percent more FN voters refuse to recognize Muslims as citizens. Their negative judgment of the Muslim religion is higher by forty-two points . . . Their sentiment that Muslims make up a separate group is higher by thirty-five points [and] . . . their refusal of judicial sanctions for insulting comments [toward Muslims] is higher by twenty-eight points. 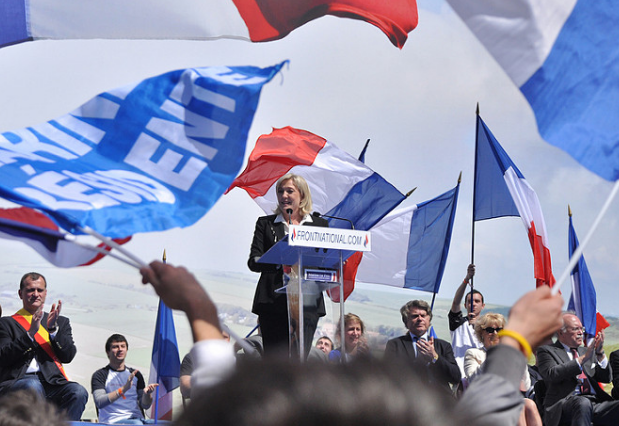 The Le Pen conflict is usually falsely portrayed as a battle between the hard and moderate lines. What was actually at stake was much more about the political functionality of antisemitism in contemporary capitalist democracies, and the actual break with Jean-Marie Le Pen has been to refuse any kind of antisemitic allusion (which has been theorized by the new leadership). It doesn’t mean that the FN broke with racist and xenophobic rhetoric. For instance, there was no struggle between Marine Le Pen and her father when the latter, invoking France’s alleged “risk of submersion” by immigration, claimed that Ebola could solve the problem “in three months.” No member of the FN leadership condemned his statements. And because you are at home, it is well within your right to be fed up with these Franco-Algerians like Mohammed Merah [a man who shot seven people in 2012, including three Jewish children], these Franco-Angolans like the Bouguenais assassin, or these Franco-Malians such as the crazies of Paris! We want the French to love of their flag, to be proud of their country! If one thing has remained constant in the FN’s rhetoric, it is the portrayal of immigration as the source of all ills, from unemployment, terrorism, and crime to the public debt and public services’ deterioration. In this, it overlaps the mainstream parties. While such violent rhetoric continues to be associated with the FN, successive PS and LR governments have legitimized it through Islamophobic legislation. From its founding to the present moment, the FN has tried to mask or soften its true political project to gain power. Its electoral successes and the broad acceptance of its anti-Muslim and anti-migrants rhetoric reveals less a fundamental transformation since Marine Le Pen took over, than a nationalist and Islamophobic radicalization of mainstream parties, media, and public intellectuals. The illusion of a transformation regarding the FN can only be produced because Islamophobia and xenophobia now pervade mainstream politics and media in France. Hitler’s “Beer Hall Putsch” was . . . put down so ignominiously by the conservative rulers of Bavaria that he resolved never again to try to gain power through force. That meant remaining at least superficially within constitutional legality, though the Nazis never gave up the selective violence that was central to the party’s appeal, or hints about wider aims after power . . . Neither Hitler nor Mussolini arrived in office by a coup d’état. Neither took the helm by force, even if both had used force before power in order to destabilize the existing regime, and both were to use force again, after power, in order to transform their governments into dictatorships. Certain French specialists of the contemporary far right deride those who draw comparisons between the current situation and the interwar period. As a result, they suggest that because today’s ultra-conservatives don’t share classical fascism’s most violent methods of establishing power, they represent a completely separate political movement. In no way does fascism lie solely in its exterior aspects (dictatorship, principle of the leader, single party, uniforms, salute, paramilitary training, supervision of the youth). As the comparisons offered above show, the political and rhetorical structures of the FN and classic fascist parties are very similar, as are the political effects of its rise. Calling the FN a neofascist movement is then not an appeal to morality in order to delegitimize the party. Rather, it is to insist on the fascist project’s continuity. Given its rhetorical and political strategy, the FN shows no sign that it has broken with the historical project of the French far right: a restoration of the nation, by the annihilation — brutal or gradual — of any kind of opposition (political, trade-union, religious, artistic, etc.) and by the submission — if not the violent removal — of all populations regarded as threatening the nation’s imaginary unity (immigrants and their descendants, Muslims, homosexuals, leftists, internationalists, unionists, and so on). Nor is this political characterization meant to indicate that FN’s active members, and even more so FN voters, are themselves fascists and would favor a far-right dictatorship. After all, in the case of historical fascism, anyone who supported Mussolini in Italy in 1921-22 or who voted for the NSDAP in Germany in the beginning of the 1930s wasn’t supporting the idea of a totalitarian dictatorship, and a fortiori the Holocaust. In Italy as in Germany, far-right movements gained power by making alliances with the mainstream right after having won significant (but minority) parts of the electorate. In Germany, no more than 37 percent of the electorate supported the Nazis before 1933. Of those, not all supported the policies that would be implemented in the following years, even if most of them undoubtedly shared a visceral antisemitism. Nevertheless, it is not unreasonable to believe that the party might evolve in another direction. As the influence of elected representatives within the party grows, they could initiate a process of political integration and make the seizure of power dependent on the preservation of their positions within the state apparatus. Right now, the FN is refusing to ally with any right-wing parties, hoping to reach power alone or in a dominant position, after gaining political hegemony. As a result, it must remain committed to its ideological base. The party’s anti-Muslim and anti-immigrant rhetoric allows it to hold its base’s interest. By making a foray into other domains — economics, public services, environment or culture — it garners support from other parts of society. In all of this, the FN maintains a political space uniquely its own, namely racism and nationalism. It falls to socialists to stake out an opposing position that can defeat far-right parties like the FN, and the first necessity is to recognize the existence of a fascist danger. Some on the Left even deny that a FN electoral victory would qualitatively change the situation for the already exploited and oppressed, arguing that the FN is only another pro-capitalist and racist party, and that it would most certainly have the positive effect to wake the people up. This is a very hazardous bet: as historical fascism shows, those who bear the brunt of far-right powers are the oppressed groups and left activists, and when a fascist dynamic prevails, its rise tends to lead the population to despondency rather than revolt. That’s why when a fascist danger exists as a concrete possibility, it has to be fought immediately with the highest energy and in the largest unity of working-class organizations. One would have to be blind not to see the danger the far right represents in France and how access to power would license the most overtly reactionary and racist elements of French society — the very elements most hostile to the trade-union movement and left-wing parties. The specific danger associated with the fascist dynamic in France, of which the FN’s electoral success is only the most visible marker, shouldn’t lead to defeatism and calls for a specific response from the Left, because though the worst is possible, it is never certain. But taking this danger seriously does not mean the radical left should ally with the PS or the mainstream right, and then submit its action to their agendas. Their policies effectively paved the way for the FN, so how could we possibly trust them to act as a bulwark against the far right and a safeguard of democracy? The PS and the Right, who have worked in tandem to enforce Islamophobic and anti-immigrant policies, should take the blame for the FN’s success. Indeed, the mainstream parties have proven to be pyromaniac firefighters in their dealings with the rising far right. Between their racist, anti-immigrant rhetoric and their social, economic, national security, and immigration policies, they have effectively increased the FN vote for the past thirty years. We cannot blame social marginalization for the FN’s rise; we must blame centrists for popularizing its beliefs. What gave the FN its newfound support is the ongoing destruction of collective solidarity, the workers’ movement thirty-year decline, and the convergence of the PS and the Right since the austerity turn in 1983. Their governments have increased inequalities, propagated unemployment, and fostered precarity. Above all, they created the widespread perception that there is no alternative. In other words, they have destroyed almost every form of political hope. Fascism has always been smart at turning this lack of hope or despair among specific social layers into a violent appeal to get rid of some imaginary enemies. Socialists in France are facing a huge challenge because the struggle against fascism is bound to fail if it doesn’t go beyond the mere defense of existing political institutions and economic regime, and if it submits to bourgeois forces in the name of “antifascism.” Only by opposing neoliberalism, which created the conditions for a fascist rise, and by leading the struggle against Islamophobia (which appears as the main form of racism in contemporary France) and every form of oppression, can we offer a viable political alternative for French workers of all races, ethnicities, and religions. France’s National Front has used all the old fascist tricks to gain power. US Workers Are Paying High Taxes. But Without Any of the Benefits.